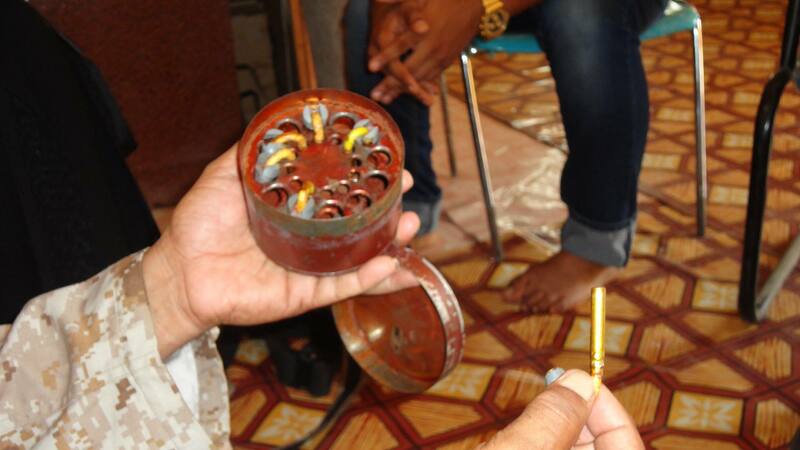 Recent photos taken in Aden, Yemen, and provided to ARES by the photographer, show detonator assemblies for the No. 36 series Mills Bomb. 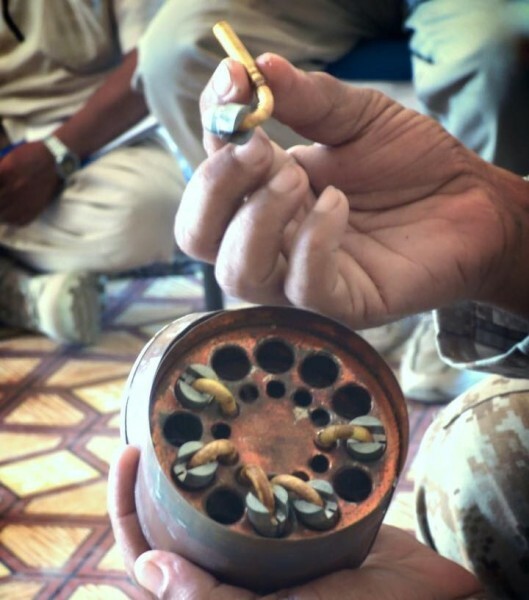 These were amongst a variety of munitions left behind by Houthi rebels as they retreated in recent weeks. The container depicted in the images appears to be Canadian in origin (or a copy thereof), and is designated as the ‘Can No. 124’. It was designed to accommodate 12 Mk VI or Mk VII detonator assemblies. Canadian examples are painted red, with black markings and a yellow numeral ‘4’ on one side. The term ‘Mills Bomb’ actually refers to several variants of a hand grenade that is almost as prolific in certain parts of the world as the Russian F1 or US M2A1 fragmentation grenades. ‘Mills Bomb’ was first applied to the British-manufactured Number 5 (No. 5) hand grenade that was invented by Sir Robert Mills in 1914/15. Eventually, it came to be associated with almost two dozen modifications of the No. 5, and its successors the No. 23 (with modifications) and the No. 36 (with modifications). The Mills Bomb – in its range of variants – served the British Commonwealth forces from 1915 through to the 1980s. It was also manufactured in Australia, Canada, Indonesia, New Zealand, Pakistan, and South Africa and, as a result, may still be found in many of the world’s conflict zones today. The detonator assembly of the Mills Bomb consists of a cap holder, a length of safety/time fuze, a .22 rimfire cap, and a detonator. The cap holder may be constructed of aluminium, brass, or zinc alloy. The time fuze may be the “Fuze, Safety, No. 11 Mk 1,” or Bickford’s No. 14. There were a variety of actual detonators used in the various iterations of the Mills Bomb throughout the family’s lifespan. For example, eight different detonators were developed for the No. 36 series of Mills Bombs. The detonator assemblies were also stored in a variety of containers, depending on the country of manufacture/origin. Further technical information is available in Darryl W. Lynn’s “The Grenade Recognition Manual, Volume 2, British and Commonwealth Grenades and Accessories” (2001).